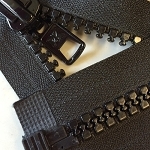 These marine zippers are different that standard plastic molded toothed zippers. Instead of being plastic, these are resin that has been tested for longevity in a salt environment. Some have resin pulls & some have metal that have been painted with a specialty paint also developed to be impervious to UV rays & salt. These zippers are used on some of the most expensive yachts in the world. BLACK #10 Molded Marine Separating Zipper 8"-900"
WHITE #10 Marine Separating 18"-900"